Check out this HOT deal on this WeeSprout Waterproof Silicone Baby Bibs – Set of 2 – Quick and Easy to Clean – Silky Soft & Comfortable for Boys & Girls – Wide Pocket Stays Open and Catches Everything – Adjustable and Toddler Proof Priced at only $16.97 was $23.99. Ships Free with Amazon Prime! SAY GOODBYE TO BURP CLOTHS & FEEDING MESS: Thanks to our silicone baby bibs you can forget about washing burp cloths every day. 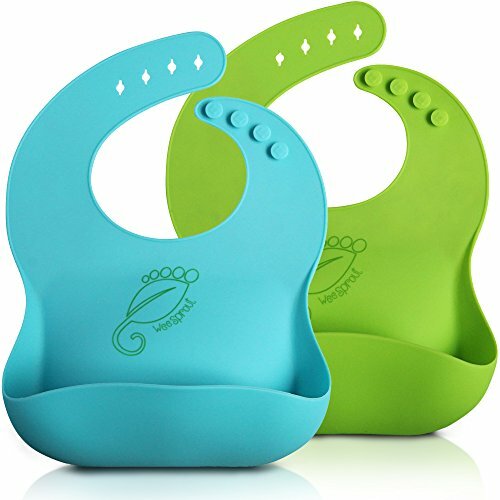 This simple yet brilliant product helps you feed your baby or toddler without making any mess, as its large, wide pocket catches any food that falls from your baby’s mouth. Feeding time now becomes easier than ever! FDA APPROVED & BPA FREE ECO-FRIENDLY SILICONE: We at WeeSprout care about your children’s safety more than anything. That’s why we only use best quality silicone that is FDA approved, antibacterial and is BPA, PVC, lead, and phthalate free. That way we make sure our bibs are not only soft, lightweight and comfortable, but also perfectly safe to touch your baby’s sensitive skin! SIMPLE TO ADJUST & TO USE: Many silicone bibs have top buttons that are easily removable by a toddler’s playing hands. Our bibs, however, were specially redesigned with four secure buttons. Thus you can easily adjust it to your baby’s neck, without worrying that your baby will take it off and make a mess! WATER RESISTANT AND EASY TO CLEAN: Silicone doesn’t absorb any kind of liquid, thus making washing our baby bibs a piece of cake. You can simply use water and soap to clean it. If however, for disinfection purposes, you wish to put them in the dishwasher or wash them in boiling water, they can stand up against 2000 C! 100% LIFETIME MONEY BACK GUARANTEE: At WeeSprout, we make a point by designing and producing the best quality baby bibs, working hard to rise up to our customers’ expectations – yours! If, however, you aren’t 100% satisfied with our product we do offer you a lifetime money back guarantee!